We posted a week or so back about the Kuma Spork Kickstarter project. Well it turns out a very very similar product already exists and is for sale. 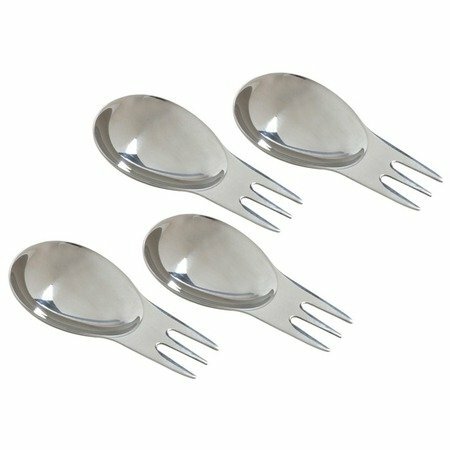 The Eco-Friendly Stainless Steel Spork has a slightly different design with longer tines and less color options and maybe a smaller spoon bowl. But I think I like this one a little better, I wish I could do a eating test with both. You will have to decide which is better by the photos like me. This does falls under our category of Everyday Carry Cutlery. This Eco-Friendly Stainless Steel Spork is 1/4 inches long made of 18/10 stainless steel. Dishwasher safe and Made in China. ← GAO denies funding for disposable flatware – No cutlery for you!